Stay warm and focused on your training and gameplan, even in the chilliest of conditions, by taking to the field in the Canterbury Base Layer Cold Thermoreg L/S T-Shirt in Navy Blue. 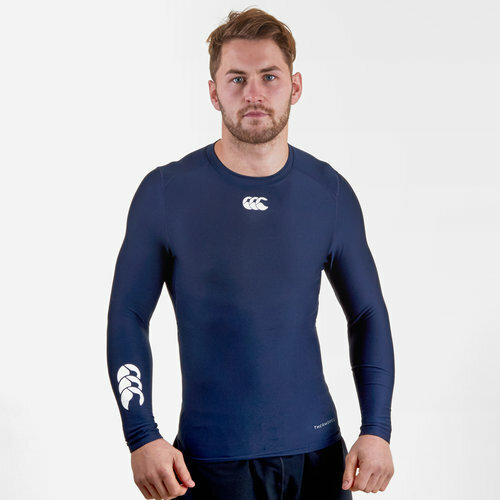 This long sleeved base layer top from rugby specialists Canterbury has a tight figure-hugging fit with performance seams which enhances the results of your exercise and gameplay by speeding up muscle recovery by improving blood flow. Made from polyester and elastane material, this base layer tee features Canterbury Thermoreg technology to help keep the wearer warm when in action by improving insulation. It also ensures the wearer stays dry and refreshed by drawing sweat away from the skin and quickly drying off. Prove your commitment to the game and resist the cold in nay situation with the Canterbury Base Layer Cold Thermoreg L/S T-Shirt.